We all know that some cities are facing housing shortages – these places have strong economic growth combined with a failure to supply enough new homes to keep pace with high demand. New data from the ONS allows us to see just how much housing cities have built this year, and, sadly, the numbers show we’ve still got some way to go. This raises a crucial question about the way English planning works. Across England, about 222,000 new places for people to live were built between 2017 and 2018. That’s a lot more than five years ago (2012 to 2013), when only 125,000 houses were built, a testament to efforts to increase the supply of housing. It is, however, stubbornly similar to last year’s total of 217,000. When housing demand nationally runs at roughly 240-300,000, it’s clear that, although the Government has managed to increase supply, there is still more to be done. That’s the national picture. At Centre for Cities though, we are interested in what housing means for city economies. As jobs are concentrated in specific places (cities), there is not a single, national housing market but a series of interlocking urban housing markets. Some cities have had much more economic and jobs growth. It is these cities that have much greater housing demand than other places. This is why the average house in London still costs 17 times average local household income, while, in Liverpool, a house costs only five times the average income. So what do the new figures look like at a city level? The map below uses the new ONS numbers to show how much new housing each city in England built last year as a percentage of their existing stock. It reveals that the national 222,000 figure hides variation from place to place – some cities are building a lot, and others are building very little. Plaudits go to Cambridge – one of the most unaffordable cities in England is building the most. The city built 1,152 homes last year, equivalent to a 2.2% increase in the existing stock of housing in the city. Other cities in the Greater South East and close to London are building lots too, including Reading, Slough, Milton Keynes, and Luton. York, as the least affordable city in the North of England, saw the fourth largest increase too. But not all unaffordable cities are doing the same. Oxford may be similar to Cambridge in many ways, but it built only 184 homes between 2017 and 2018, a mere 0.3% increase in total housing supply in the city. That was the second lowest percentage increase in housing of any English city. That has a clear effect on living costs, with Oxford being the most expensive city for housing in the UK. Similarly, despite massive affordability pressures of their own, Brighton and Bournemouth have also built very little. If we look at some of these places where fewer new homes have been added, like Crawley, part of the reason may be that Permitted Development Rights (PDR) conversions have decreased sharply – from 13,400 in cities last year to 8,700 this year. PDR allows property owners to flip how a building is used, typically from office to residential use, without additional planning permission. 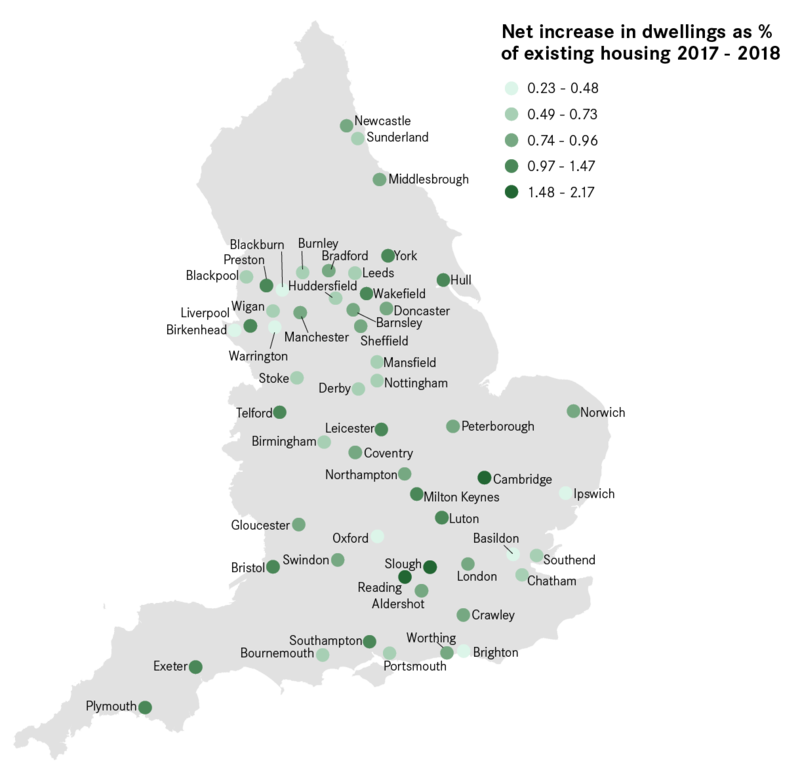 Centre for Cities research showed that PDR was particularly popular in cities like Basildon and Southend, in easy commuting distance to London, and these are the cities that have seen particularly sharp falls in PDR usage. This decline might suggest that the low-hanging fruit of empty office space has been exhausted in cities and that PDR may now begin to be used to convert higher-quality office space into housing. There was a risk too much PDR would end up cannibalising office space in the local economy so the recent slowdown may, therefore, be a good thing, even if it means a stalling in national housing numbers. But the fall in PDR alone cannot explain why some unaffordable cities like Oxford and Brighton are not building enough homes – both saw fewer than 100 PDR conversions last year and this year. Instead, it appears the biggest difference between these cities and places like Cambridge, Reading, and York, which are addressing their housing shortages, is that the latter have simply made the hard political choice to build more housing. As a result, the Government needs to start thinking about the next wave of reform to address this. The long-term objective should be the creation of a housing market in which the local supply of land available for development can respond to demand and prices, rather than being blocked by local opposition and nimby-ish anti-housing activists. There is an argument to be made, such as in the recent Raynsford Review by the Town and Country Planning Association, that reducing participation in the planning process is undemocratic. But is a planning system more democratic if it empowers people to veto new homes in their cities and create housing shortages, or if it successfully delivers housing in the places where people want to live? How the Government answers this question will be decisive for the future of our cities and the housing shortage in them. The supercilious comment about house building being blocked by local opposition and NIMBYish opposition to housing might carry some weight if accompanied by a link to evidence. But there is none. What Council is against more ratepayers? The problem is not opposition – opposition to uglification must surely generally be a good thing – but a hopeless planning system which fails to deliver locally acceptable results. If, as seems to be implied, your solution is more centralisation, more targeting at a distance, then No Sir! You are heading in entirely the wrong direction. Local consensus-building, devolution of power, and root-and-branch reform of the planning system to a properly plan-led system on the continental model, are the way forward. Quite frankly, you appear to have only addressed one aspect of the problem and over-simplified the housing supply situation to provision of land vs nimbys! Would suggest that housebuilders are behaving like oil producing countries in the Middle East….it is to their financial benefit to ensure there is a shortage of new housing as this keeps the prices nice and high. Land with planning permission for housing is not being developed and this may or may not be because of worker and skills shortages in the construction industry. There are 1000s of older empty homes in urban areas around the country that could be adapted and renovated to make decent accommodation. There are brownfield sites that are in need of re-development. On the issue of political opposition to new homes, those cities like York, Cambridge, Reading and Bristol are taking their residents with them on the need for new development and l would suggest that these places are likely to have had more dialogue and involvement in the process rather than less. Whether the government bites the bullet on this or not, there is and will likely always be a need for an effective level of public subsidy in affordable and social housing. The level of new housing bought for investment purposes by finance organisations and foreign investors and not used to house anybody needs to be investigated, especially in London, because this activity may be artificially overheating the local housing market and exacerbating housing need. The provision of new housing is only one aspect of accommodating an increasing population. There are all the other services and infrastructure that must be provided and developed in tandem. Once upon a time there were regional plans that addressed all this and tied required development to existing and required resources. Now we have a NPPF and these issues will again be addressed…we live in interesting times. It’s no good bleating about building more homes without some reference to who actually needs them. Analysis I have carried out of recent household projections shows that around 90% of newly forming households in England over the next 20 years are currently under 25. Even with Help to Buy and bank of Mum and Dad not many of these will be able afford to buy – builders for sale target existing home owners (clue: they have the money). If more new building actually started to reduce prices, you can be sure the builders will stop building. In the meantime we are busy selling off non-market stock, leaving private renting as the remaining choice. Great! Poor, one sided analysis of the data picture. Typically the developers only build out slowly, – what they can sell immediately – , to keep prices up. The only way to break through this logjam will be by land reform, like a land value tax, capture of more of the increase in value of land due to grant of planning permssion, and a major programme of public sector affordable house building.